Welcome to Santa Cruz, California for this stop in the Trip Around the World Blog Hop. I assume you've just came from The Emerald Isle with Heather McAlendin, which is quite ironic since the book I'm offering for the giveaway is called The Emerald Talisman. So now it's time to shed your coat from Ireland, take off your shoes and walk up the beach or enjoy some funnel cake at the Santa Cruz Beach Board Walk...oh...and bring a good book... how about one centered in Santa Cruz? For those who are fans of Buffy the Vampire Slayer, Blade and Twilight, The Emerald Talisman is right up your alley. And if you don't win it here, it's only $0.99 on Kindle/Nook right now! When Julia Parker, a sixteen-year-old with the paranormal ability to read people's emotions, accidentally falls prey to a vampire, she becomes aware that sometimes animals and people aren't who they seem. To survive, she must rely on her psychic abilities to help her decide who to trust and who to love. 1 signed copy with matching bookmark. To enter: please comment and leave your email address. I just ask you also are a Google Follower. The next hop spot after me is Wellington, New Zealand with Bronwen Evans. 6) Did we mention have fun? Thanks for sharing ifo about Santa Cruz and good luck with your book. Thanks for the contest. I know I will love this book. Ohhh... would love to win this book! Thanks for the giveaway! I'm a follower but already own Books 1 and 2 that you have written :D Enjoyed #1 so much I bought #2. :D Have yet to read it, it's on the list. Sounds like a wonderful read. Thanks for joining the Hop. I love this book and really want a signed copy! Thank you! I am a goodreads, facebook, and twitter follower. Sounds interesting. Like the picture. Thank you for sharing. I would love to win a copy of this book. Thanks for sharing! I would love to win. Santa Cruiz looks like a place Id love to visit !!! Lovley pics btw !!! I follow you on goodreads as me !! Twitter I am run_with_wolves and have retrwwweeettee for you ! I;ve never been to California but it sounds awesome! The pictures you posted were awesome! I'm a GFC follower BTW. Your book sounds good. The cover is lovely! The cover is gorgeous. I loved Buffy! Haha, I grew up in California... I'm from the Bay Area, so Santa Cruz is a second home to me... Downtown SC is FUN! East Meets West, The SC Bookshop... Gods I miss it! I'm following you as IngaSilberg in Twitter and Goodreads and also in FB. Never been to US yet. Would love to see all these wonderful places. P.S. I'll send you the questions for interview soon! Yep this book is right up my ally. Can't wait to read! I love barefeet and the beach. Too bad I live nowhere close to one LOL. Oh, great! 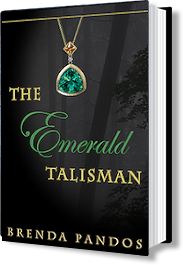 The Emerald Talisman has been on my radar for a while now, this would be a great opportunity to read it already! As for Santa Cruz...*dreamy sigh* It seems perfect, it's one of the locations I mention when people ask me where would I like to go on my next vacation. Anyway... thank you for the giveaway! Now I also follow you on Twitter (@DeeutzAs), Facebook and Goodreads (Deea Andreea). Thak you so much for the giveaway!! I am HUGE fan of this books! Awesome I'm an hr away from Santa Cruz I'm in Union City :)~ I love the CA beaches. I'm now a fan on goodreads as well as fb :)~ my email is reannabartley(at)gmail(. )com I have a fb page as well its www.facebook.com/Dragonflynight its for the quilts I make :)~ Hope you enjoy.. Pretty pic. of Santa Cruz. Love the cover for The Emerald Talisman! Thank you for sharing Santa Cruz...oh, for a beautiful sandy beach instead of rain right now! The book has very beautiful cover! Santa cruz seems like a lovely place to visits, Thanks for sharing it with us! Added you on my Twitter and on FB too. And following you here too, of course! Thanks for the giveaway, your book sounds great, I would love to read it! Thanks for the contest!! I sounds like a wonderfull place!! I've been to California before but not there!! I follow you on facebook, twitter and goodreads!! Im follower on here and goodreads! !